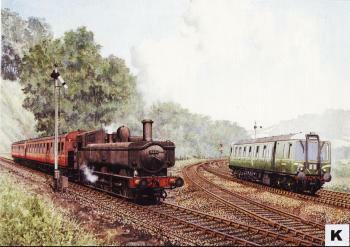 A symbolic meeting outside Yeovil in the early 1960s as steam gives way to diesel on the branch lines. Not that the replacements did the branch lines a lot of good. The first diesel multiple units - 2 or 3-coach trains with underfloor engines, capable of being coupled together in different formations - went into traffic on 14 June 1954 providing an improved service between Leeds and Bradford, and Leeds and Harrogate. Later that year DMUs began work on the lines of what was then called West Cumberland. With a standard of interior comfort well above that of the average ageing steam-hauled carriage and deep wide windows that would not have disgraced a railway officer's observation saloon, they were enthusiastically received by the public, especially on the scenic routes. The DMUs were introduced as part of a £2 million renewal programme announced in advance of the main modernisation plan of 1955. The latter called for even more of them and over the next decade thousands were built, replacing steam from suburban services and branch lines across the country. Despite the considerable economies possible with the new form of traction, however, the DMUs failed to save the branch lines from Dr. Beeching's secateurs. For, although relatively modest attempts were made to promote the advantages of the new diesels, all too often a line's raison d'etre had long since disappeared by the time they arrived. The 1955 modernisation was intended to put a new face on the existing network, although it recognised a need to close some under-used lines. What it failed to anticipate was a fundamental change in the British people as they emerged from the long years of post-war deprivation into Macmillan's "never had it so good" era. For the first time there was full employment, and luxuries such as washing machines, televisions and foreign holidays were within reach of the average working man. And there were cars - which increased in number from 4.2 million to 6.3 million in just four years from 1957. A new generation was growing up for whom trains - even shiny new diesels - were old fashioned, and for whom freedom was a set of wheels. The Beeching Report assumed they were gone for good and shut down almost 3,000 passenger stations and around 3,750 miles of route. Today the picture has changed. On 3 October 1987 Network South East brought into use the 15Oth station to be opened or re-opened since the Beeching cuts. Haddenham and Thame Parkway serves the travel needs of 25,000 people, and with its 180-place car park brings the railway once again within easy reach on the fast-growing town of Thame which lost its own station in 1963. Haddenham and Thame Parkway was not an isolated incident. A week later six more stations opened, making a total of 75 new stations in the five years to the end of 1987. The capital cost of many of these new stations is shared by BR, the local authority and local amenity groups. They are provided in response to demographic changes and alterations in the pattern of demand for travel, or to solve traffic problems by offering park-and-ride facilities. Exactly the sort of changes that the mass dieselisation of the 1950s failed to take into account, and the sort of thing that the Beeching Report showed no interest in. Now the DMUs themselves are being pensioned off in favour of the new Sprinters and Pacers - many to join 0-6-0 pannier tank No. 6430 for a life of ease on a preserved railway.